Have a Crown D75 and it works great except for one small issue. The transformer hum / buzz is getting quite annoying. Any tips on reducing this noise? During this thread I refurb'd 4 D75s. I was trying to do 5 but I succeeded in blowing up one of the transformers that you are asking about. Silly me I thought an amp that is rated at 35watts per channel into 8 ohms should be able to do it continuously. Not so, I melted the insulation on the transformer windings. So I had to do a transfomer swap from the fifth unit into the one with the bad transformer, thus now I only have 4 good amps. There are no replacement parts available unless you want to get one custom built for around $500. Anyway what I know about the transformer is it is mounted into the chassis with double sided foam tape on one side and two rubber bushings with threaded inserts on the other. You could try replacing the bushings and foam tape if they have dried out/cracked/deteriorated with age. But if the hum is being caused by the laminations of the transformer core separating there is not much you can do. All of the above assumes you are referring to hum coming from the unit itself and not through your speakers. No tip, I was using 2 for active 2 ch and eventually, they both got a buzz. It was the actual amp that was buzzing and NOT through the speakers. I really liked the sound but changed them out for something else. They had a slight buzz and one started getting louder, I took off both covers to find one with something looking a little burned. I had no idea what I was going to use when a forum member had a couple of 50 wpc amps for sale cheap so I figured I would try them until I could figure out what to do. They sounded fine so I have not done anything yet, Roy looked at the amps and said he liked them, non switching a-b amps but a big power supply and medium capacitors. He thought it was better to have it in that order, I don't know about those things, I know they were cheap used and still cheap new, I paid a little more than half used and they are only $229 new. Still don't know what I will do, if something comes up at a good price I might switch, no rush really. To me these sound as good as the D-75's, very close anyway, no hum or buzz or any noise out the speakers, quiet. Don't laugh but it's Emotiva A 100, at 50 wpc, they do have more power than the D-75's positively. no telling what I will end up with, just remember I am a cheap *******, but I was quite surprised how they sound. they both got a buzz. I have no idea where there built but your probably right, just some people don't care for the brand no matter how it sounds. It seems the brand name or price does not guarantee anything these days. I figured for that price if I didn't care for them they could be used somewhere around here. As you might guess, I have no problem with a slight buzz but this one was only in my ears, at least it was not in the speaker also. I was also worried about if it went out completely it might take some 402 diaphragms with it and maby some K33 woofers. it might take some 402 diaphragms with it and maby some K33 woofers. Or to be PC, double plus ungood. I think more people are "not laughing" at Emotiva gear these days. I tried one thing from Emotiva, a DAC and it did very well so I thought I would try these used for a little more than half price for 2. But for full price, it is a good deal @229 new each. To me, they sound fine, completely quiet and a good bit more power than the D 75, but I did really like those but they are all used and not cheap to rebuild. I really don't need any more power for what they are powering, I actually keep the volume knob at 50% unless I really want to shake the house. I really did like the Crowns but always thought I could use a little more power for crazy times. I can't complain I had them for probably 10 years. Never know, if I run across something better for the right price I might try it ? 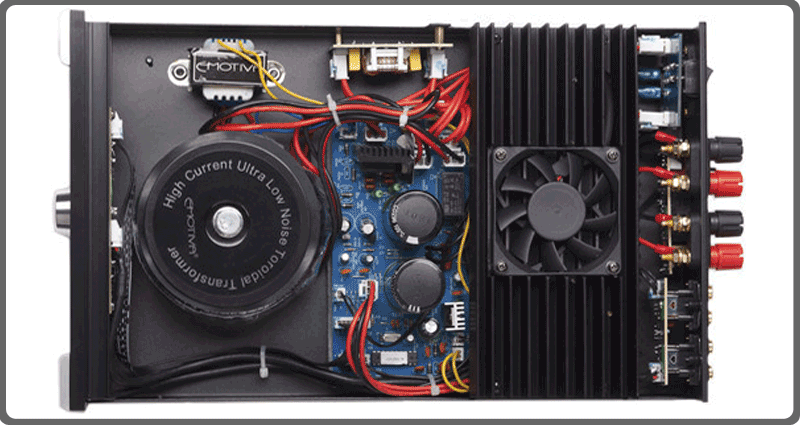 @dtel , do you know if that Emotiva amp uses discrete output devices? In otherwords, not a chip type amp. Since their literature says it operates A/B, I am assuming they are discrete output devices. I don't know about that, went to read and never found anything, even in the manual so I would guess it's not discrete? It has a transformer and 2 caps so I guess not a chip amp if that's how it works? 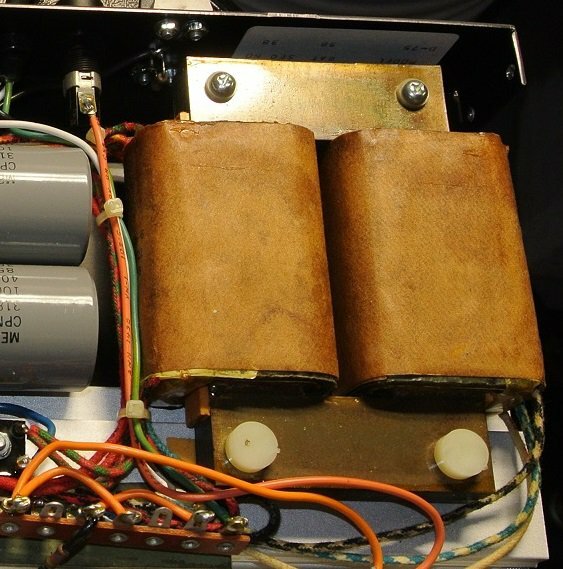 I thought chip amps didn't look like that, but it's why I don't build them I have no idea. Can you tell from the picture ? I can't see enough in the picture to tell. I will have to be on the lookout for some smaller amps to use is I go active and was simply curious. The transformer couples to the chassis and the chassis covers act as sound boards. 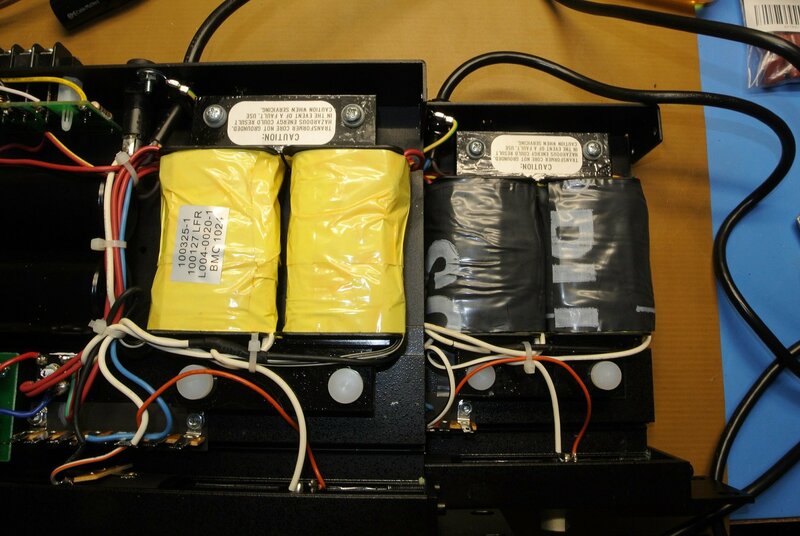 On the bench, the amplifier is quieter with the covers removed. I suspect you'd prefer not to use the amp with the internals exposed. There are wooden enclosures for the D-series amps but they're hard to find. Alternative is to make a wooden enclosure. On the Chinese amps I've wrapped the coils with Mu-metal and poly over-wrap but that makes for a tight squeeze but there's some attenuation of the buzz. I've also removed transformers from donor units and swapped them into the Chinese versions. The older transformers were impregnated with varnish and then paper wrapped (right photo). May be worth a shot, and is inexpensive enough to try out without much heartache.